A staghorn acropora in my home aquarium. 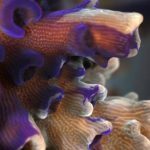 Jon Robbins recently posted his response to this article about the trends in reef building corals. My co-blogger got stuck on the idea of hybrid acros, but I thought I’d talk about some of the other aspects of this study that was recently published in Proceedings of the Royal Society of London B by Mikhail Matz. 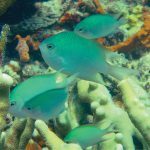 The findings from this article can be reduced to two major points: the first point is that there is variation in the behavior of coral larvae and that behavior is correlated with color. The second point is that the larvae that appear red in color tend to travel the farthest, whereas the larvae that are green tend to settle. The benefit in this case is that the larva that travel farther might be able to find a better (read: cooler!) environment in which to settle and grow. The author leaves the actual genetic underpinnings of this a bit up in the air. Ultimately, this article gets back to basic concepts in evolutionary theory, namely evolution by natural selection. If I ask anyone, “What is evolution?”, approximately 70% of respondents will reply “Survival of the fittest.” This amuses me because Charles Darwin, the author of the theory of evolution by natural selection, never used the term “survival of the fittest”. That term was coined by Herbert Spencer, a so-called social Darwinist who wanted to apply Darwin’s theory of natural selection to people’s moral characters. The real idea of natural selection is that there is natural variation within each population of organisms. Among those variants, some will be “better” than others. What is better is always determined by the environment; there is no such thing as a “good” or “bad” trait unless the trait causes immediate death. Those individuals with the best traits should then have the most surviving offspring and those traits should then be more common in the next generation. Now, if we go back to our example of the coral, there is natural variation occurring in that population: the color of the larvae. And it seems that those larvae that are red are better suited to the environment because they have the ability to travel further into a more hospitable climate. If we follow the theory, then in the coming generations there should be more red fluorescing coral that survive and shift the predominant color of this species of Acropora. Pseudorina alifera, an extinct relative of modern sharks alive during the Jurassic house at the American Museum of Natural History in New York, NY. It’s good to know that coral reefs have this ability to adapt to their environments since coral reefs are evolutionary hotspots and make a major contribution to biodiversity on this planet. 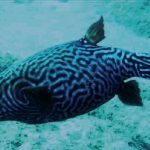 Coral reefs originated some 540 million years ago during the Cambrian explosion, an evolutionary event that marks a huge increase in the diversity of complex, multicellular organisms. 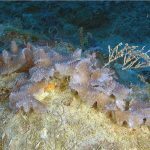 There is evidence that coral reefs once inhabited areas that are now too cold and too dark to sustain current reef building corals. 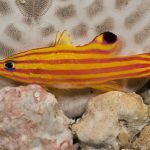 Apparently, the most adaptable portions of the coral reefs are the areas along the outer edges (which makes sense) and they would be the least protected and under the greatest pressure to adapt to survive. This is all important information, as with the rising global temperature and ocean acidification, corals are going to need to be able to adapt to survive.